FSU has had a strong history of student self-governance. In 1909 the institution became the Florida State College for Women, and in 1935 the College Government Association (CGA) was formed with executive, legislative and judicial branches. Admitted in 1946, men quickly succeeded in the CGA, and the first campus political parties, the All-Florida Party and the Independent Party, began. After the birth of FSU in 1947, the CGA created a separate Men’s and Women’s Government Association, headed by Phillip Roundtree and Dalia Santos Meza. In 1948 the groups merged, and Charles McMillan was elected the first Student Body President of Florida State. In 1949 the CGA became the University Government Association (UGA). Men held the top two executive offices until 1957, when Jan Kaminis Platt was elected Vice President, the first female to hold that post since FSCW days. During the 1960s, Student Government grew immensely. In 1962 Student Body President Kenza van Asserderp received use of an official car for SG business. Student Body Vice President Joyce Killan Godwin recalls students protesting the Cuban Missile Crisis and the drafting of college men. A year later UGA established a student-owned bus system, the revision of women’s social regulations, and the merger of the Men’s and Women’s Senates into one legislative body. In 1973, Charles Thompson, an African American, was elected as the first black Student Body President at FSU. Many other minorities have followed in his footsteps and FSU SGA continues to be a testimony as to the diversity that is present on this campus. In 1974 Student Body President David Aronofsky, Vice President Jan Pietrzyk and Senate President Doug Mannheimer were the first student leaders to set and allocate A&S fees. Gov. Reuben Askew, the 1950 Student Body President, signed the act into law. In 1975 President Apollo Visko and Vice President Deborah Pistana Bennett set the first A&S budget and registered more than 10,000 students to vote, causing the defeat of an anti-student sheriff. In 1989 President Sean Pittman and Vice President Amy Arnold Mayer developed the SGA Movie Channel and returned the Homecoming PowWow. In 1993 president Tracy Newman had FSU named one of 13 worldwide sites to participate in President Clinton’s inauguration. In 1996, Liza Park serves as the first Asian American Student Body President. Under her tenure, together with Faye Hunt and Rich Sealy, the Asian Student Union, later known as the Asian American Student Union is established as an SGA Agency. In 1998, the Felix/Fields administration began lobbying for PowWow in the stadium, and that effort was carried on by the Fedele/Harris, Cooke/Rothstein administrations and was obtained for 2003 under the Johnson/Paul administration. In 2000, the Cook/Rothstein administration successfully lobbied for the SGA president to be a voting member of the newly created Board of Trustees. In 2001, President Delmar W. Johnson III became the first named member of the FSU Board of Trustees in the modern era. In 2002, the Johnson/Paul and Pletch/Sullivan administrations successfully implemented a fall break for students. In 2004 the Eady/Hanson/Schoonover administration successfully lobbied against the implementation of block tuition at FSU. The administration was also able to allocate the funds to build the new and improved intramural fields, which opened in 2007, as well as funds to create a brand new career center for the student body. In 2008, The O’Shea/Counts administration created the TRUE Seminole Campaign in collaboration with the Seminole Student Boosters. In 2010, the Daniels/Seifter Administration successfully lobbied for the implementation of an inclusive non-discrimination policy, the creation of the College Leadership Councils and the NoleCab taxi service. In 2012, the Stokes/Porwall administration successfully hosts Pow Wow in the stadium, negotiates free towels in the leach, and structures the agencies, bureaus, and leadership institutes under the Vice President. In 2013, the Contreras/Saxner/Kurleman Administration was the first all female President and Vice President team and created the first Secretary of Arts position and the first Veterans Student Union, as well as founding the Office of Entrepreneurship and Innovation (OEI), a bureau of SGA. In 2014, the Cavallero/Johnson/Rendon Administration implemented new strategies to support campus traditions, such as Seminole Uprising or having Kevin Hart for a Headliners show, and served to support the transition of new University President and student initiatives such as the Office of Entrepreneurship and the kNOw More Campaign. In 2016, the Tabares/Pierre-Louis/McGuinness Administration successfully helped to lobby with major individuals and legislators to receive the $1.5 million in PECO funding for the new Black Student Union house, created the first Secretary of Diversity & Inclusion, cultivated the Minority Recruitment Initiative (MRI) to recruit diverse student leaders during preview days, hosted the first Arts Showcase, instituted a Flat-Fare Ride to the Airport, Parking Forgiveness program for all first-time tickets, and the Rez-Rides initiative. In 2017, the Molina/Shallow/Gibson Administration provided free blue books for students during finals week, served as the student voice for the new dining contract, supported the new student union program and collaborated to support STEM students on campus through programming and additional workstations in Dirac library. In 2018, The Hill, Pierre, Cortez administration successfully advocated with OGA for students in the state legislature, developed the Diversity & Inclusion Institute, co-created the Remove the Mask campaign to support mental health intiatives on campus, and saw increased Agency collaboration and programming. Student government leaders have helped shape FSU and created power for students. 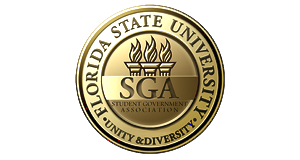 Because of their work, the Student Government Association holds an important place at Florida State University.